Among the cycling options within Randwick City are two dedicated bicycle tracks where you will encounter green open spaces and relaxed surroundings while staying fit at the same time. More details about Randwick’s Cycleways. The first of these is through Centennial Park, one of Sydney’s finest and most used parks comprising 189 hectares featuring formal gardens, ponds, grand avenues, statues, historic buildings and a variety of sporting facilities. The bicycle track makes a full circuit of this grand park. Whilst riding you will see several expansive ponds abundant with wildlife, horse riding enthusiasts, walkers, joggers and organised sports such as cricket or football. The park is home to diverse flora and fauna and many significant tree plantings, including spectacular Port Jackson figs, Holm Oaks and Norfolk Island Pines engendering a sense of wilderness. Also, within the park there is a bicycle track especially designed for children. Situated in the western corner of the park, next to Kensington Ponds, it provides an ideal environment for child safety and parent supervision. If you don’t have a bike, don’t worry, bikes can be hired from Centennial Park Cycles. For more information contact them on 02 9398 8138. 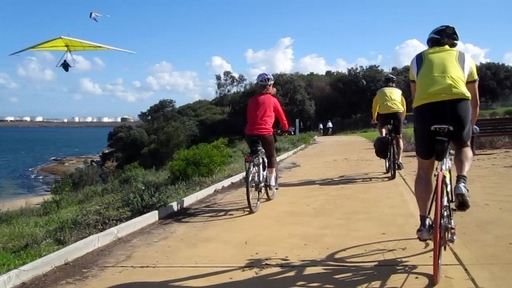 At Heffron Park it is a matter of BYO bicycle as there is no nearby bike hire facility. At all times when cycling appropriate safety gear must be worn.